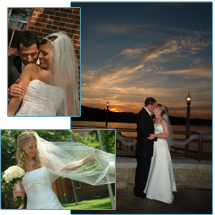 There are two popular styles of wedding photography: traditional and photojournalistic. In traditional wedding photography the events of your day are captured through a series of posed photographs. For instance, in traditional photography the bride and groom are told to face the camera while cutting the cake or sharing their first dance as husband and wife. While this has been a popular form of photography for many years, it often produces images that look forced and unnatural. In photojournalistic wedding photography, only your family portraits will be posed while the rest of your day is photographed as the events unfold. Photojournalism is about telling the story of your day by standing back, watching closely and letting moments happen naturally. In this style of wedding photography, the bride and groom are encouraged to revel in the joy of cutting the cake or share their private dance without interruption, while the photographer captures the romance and emotion of the moment. At Adler House Photography, we specialize in a photojournalistic style that will reveal the emotion of your day, focusing on the embraces, tears, joy and tenderness that make you and your day unique.